The uniquely designed Las Palomas apartments are built on a rectangular block with each building consisting of a number of Studio and 2-Bed apartments. The interiors of the Las Palomas Apartment flow through dining space are featured with well-appointed materials and finishes that could make you work better, eat better and sleep better in your apartment. 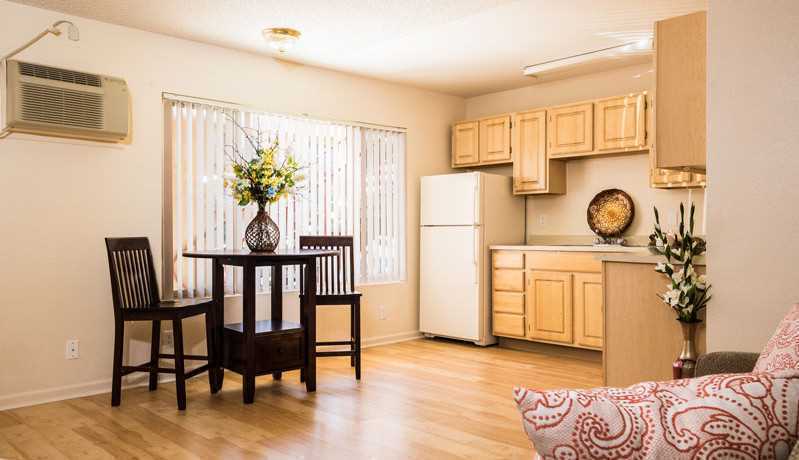 It would be convenient for you to take your meals at the Las Palomas Apartment flow through dining space since the kitchen and dining rooms are within easy reach due to the open floor plan design that makes it easier to transfer cooked meals from the kitchen to the dining table. With a lot of wood maple cabinets inside the kitchen combined with high ceilings, it’s living in comfort and luxury as you enjoy in the beauty and functionality of granite countertops at the kitchen, and the ceramic-tiled bathrooms, adding glitter to a great lifestyle in the Las Palomas Apartment flow through dining space. The 2-Bed, 1 Bath Las Palomas Apartment flow through dining space has it entrance at the almost 149 sq ft living room that flows into a 49 sq ft dining area, and the kitchen. Beside the kitchen is the bathroom. The larger 132 sq ft bedroom is beside the living room, while the other bedroom a 118-sq ft area is adjacent to the first bedroom and the bathroom. The attractive frontage of the Las Palomas Apartment flow through dining space shows a 3-floor structure with partially open spaces lined by wide porches with steel railings at the center and artistically placed staircases on the two sides of the frontage. The entrance to the open floor plan Studio is at the 180 sq ft living room. From the living room the open space flows through the kitchen where dining can also take place in the Las Palomas Apartment flow through dining space. From the living room you can walk through the 192 sq ft Alcove which functions as the open bedroom and work area. Beside the Alcove of The Las Palomas Apartment flow through dining space Studio is the relatively large bathroom and in front of the bathroom is an oversized walk-in closet. The dining area can enhance your comfort and productivity. 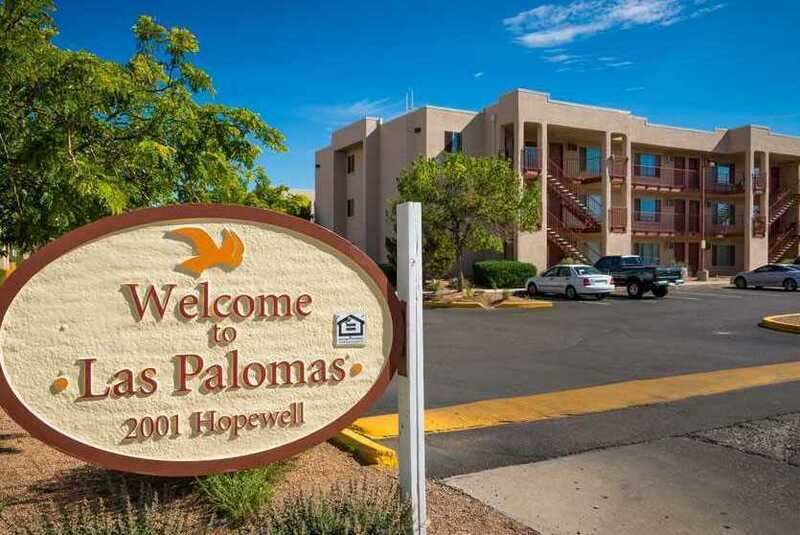 We can schedule a private tour for you to find your new apartment at Las Palomas 2001 Hopewell Street, Santa Fe, NM 87505. Call now at (505) 984-8887. You can also come directly to our office and meet our experienced and friendly staff. We are open 24/7 from Monday to Sunday.